California Pomegranate Wonderful Variety for your health! Jarrow Formulas® PomeGreat™ Juice Concentrate is made with California Wonderful Variety pomegranate fruit. 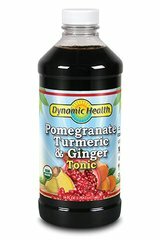 It is 4 times more concentrated in antioxidants than regular pomegranate juice. Pomegranate tops all other conventional fruits, including blueberry and strawberry, in its ORAC (Oxygen Radical Absorbance Capacity) value, ranking pomegranate as one of the most powerful antioxidant fruits.